Visiting the capital on a budget? 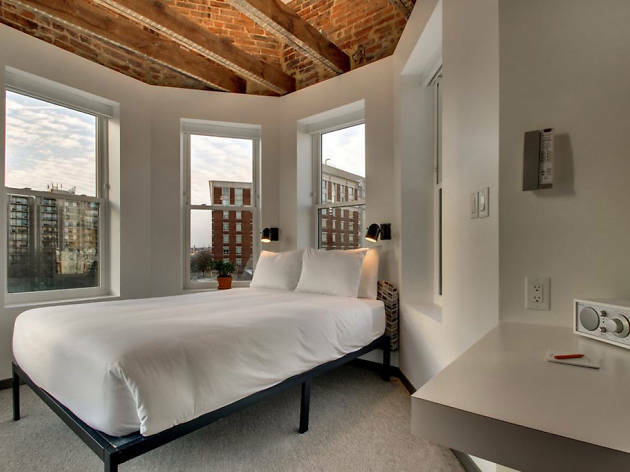 Worry not: You can save some cash by staying at the best cheap hotels in DC. Whether in town to visit the best Washington DC attractions, eat at every single one of the best restaurants in DC or get some solo time in while relaxing at the best local parks, one thing is certain: Saving money always feels awesome. 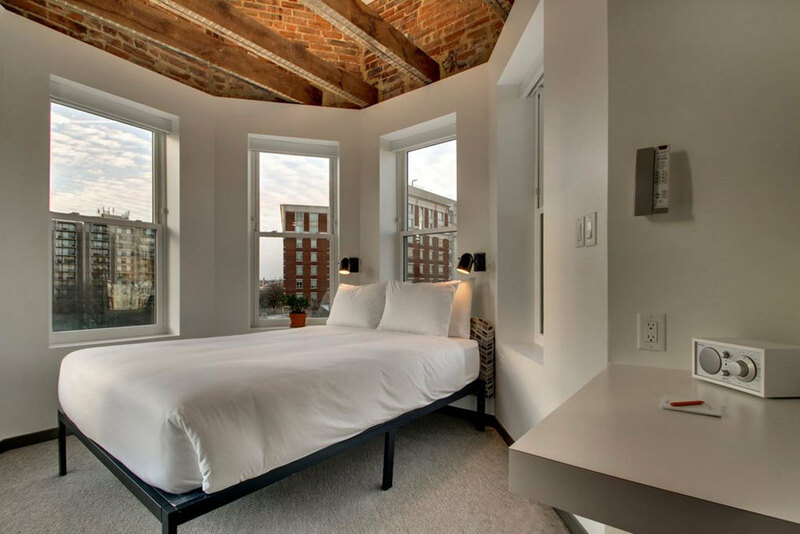 Enter the best cheap hotels in DC: Comfortable and beautiful accommodations that won’t break your wallet. Trust us, you’ll want to use that extra cash while shopping around the capital. It’s tough to believe that what is perhaps the world’s most famous hotel, which underwent a stunning $200 million renovation and re-opened in 2016, is relatively affordable. 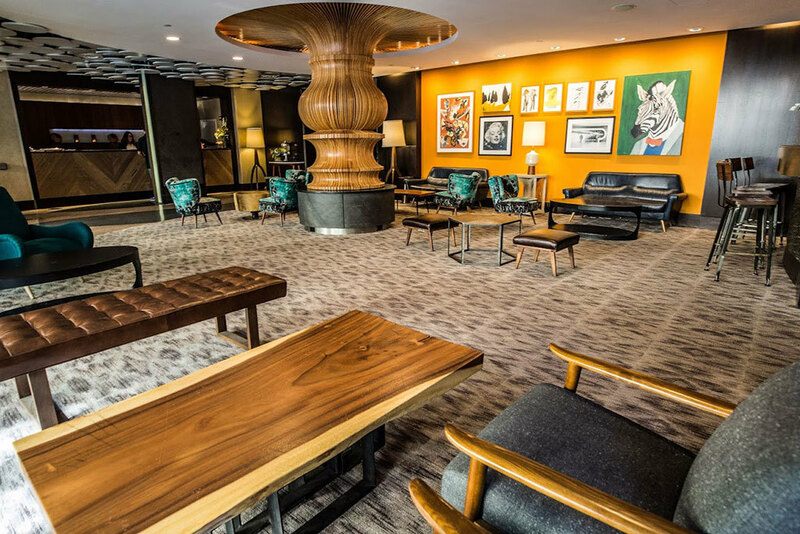 All it takes is one gander at these luxurious, ’60s-inspired rooms designed to make you feel like you’re floating on a yacht in the Potomac River to know that the $200-per-night price is a steal. 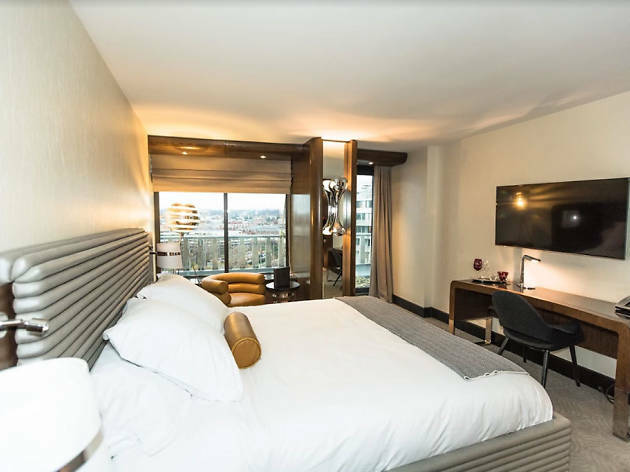 Guests can use the well-equipped fitness room and the gorgeous indoor pool, sauna, whirlpool and unisex steam room found on the same level as the spa, which offers massages, facials and a nail salon. The hotel allows pets who are 50 pounds or lighter. Time Out tip: It would be a crime to leave the property without heading up to the rooftop bar, Top of the Gate, to drink in the view and a few cocktails, of course. 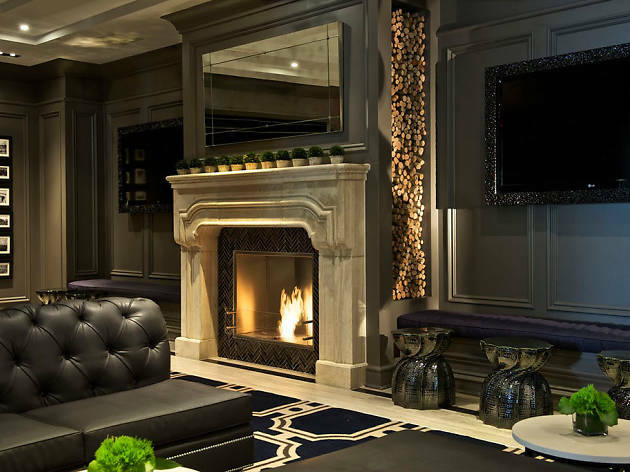 The Deco-inspired lobby and lounge are stunners while the rooms themselves are chic and modern yet cozy. What else could you ask for? The hotel restaurant, Jardenea, is pricey but very good, particularly if you’re looking for a romantic dinner. If you prefer, head to one of the myriad nearby dining options instead, offering delicious food at every prince range. 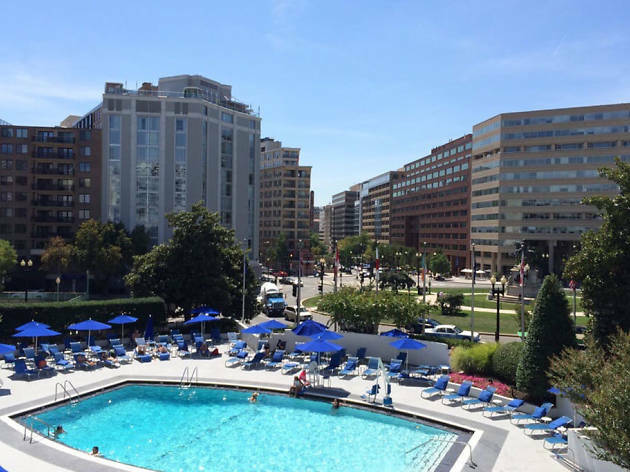 And, while the hotel is situated slightly west of downtown, it’s a breezy walk to the heart of Georgetown, George Washington University and Rock Creek Park, which runs through the city from north to south. Time Out tip: One of the city’s few Trader Joe’s locations sits one block away, so stock up on picnic supplies and head to Rock Creek or the banks of the Potomac River for lunch one day. This gorgeous hotel in the shadow of the Capitol dome pretty much has it all: a top-notch restaurant, Art & Soul, backed by celebrity-chef Art Smith; room service provided by the same delicious kitchen; a swanky rooftop pool complete with rentable cabanas; and pet-friendly rooms that look much pricier than what you’re actually paying. The venue’s location is pretty perfect, too, being so close to Union Station, many of the Smithsonian buildings and the U.S. Botanic Garden. Keep your eyes peeled for members of Congress, who like to make deals over crab-topped deviled eggs and plates of fried chicken in the hotel restaurant. Time Out tip: Yoga fans will love the weekend classes held on the rooftop in partnership with local studio East Side Yoga. 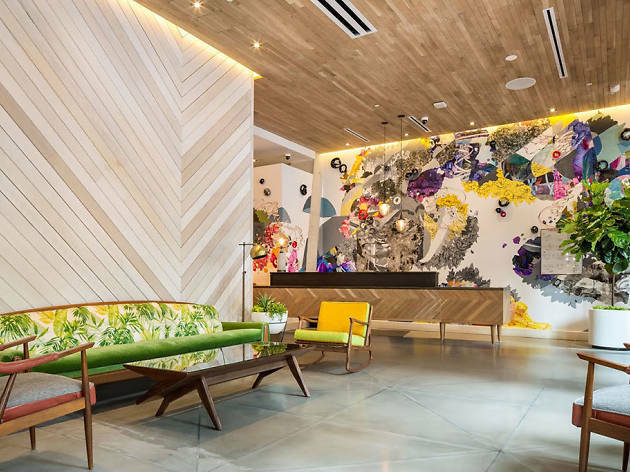 If you like your hotel to be every bit as fun as the rest of your vacation, this newly renovated pet-friendly hot spot should be at the top of your list. The wildly decorated rooftop lounge boasts a saltwater pool and a wall covered by bright artificial grass. You’ll want to relax inside colorful cabanas or enjoy the silent discos and spin classes that involve stationary bikes submerged in the pool. The restaurant, Station Kitchen + Cocktails, just relaunched with a new menu inspired by the surrounding embassies and mid-Atlantic cuisine. 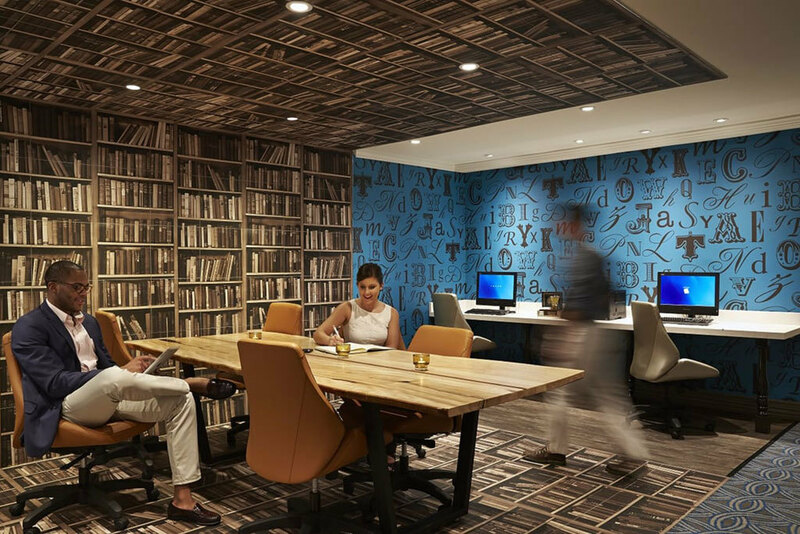 The hotel also offers in-room spa services, a fitness center and games like foosball, shuffleboard and ping-pong in the subterranean lounge. Time Out tip: Two off-menu cocktails can be ordered by those in-the-know—the whiskey-based The Hunt and the gin-spiked Tunnel Vision. 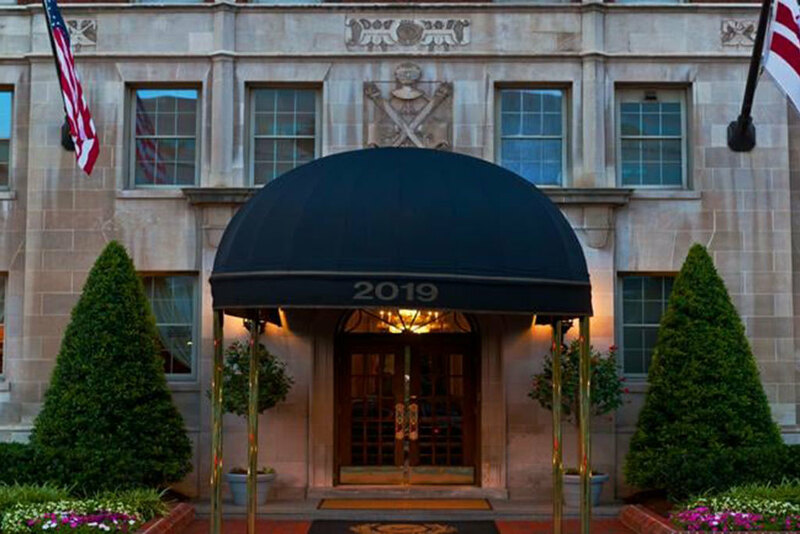 Located about halfway between Georgetown and the National Cathedral, this pet-friendly hotel situated in a residential section of DC can nevertheless seem far from many city attractions. No matter—guests are offered complimentary shuttle service to and from the National Zoo, nearby universities and other city landmarks. Although you’re encouraged to indulge in the various dining options found on the commercial strip on the next block over, we suggest not missing out on the restaurant and bar located just downstairs from your sleek, modern room (make sure to request one with a kitchenette!). Casolare serves wonderful wood-fired pizzas, pastas and seasonal plates, plus top-notch Italian-inspired cocktails. The food is also available for room service. 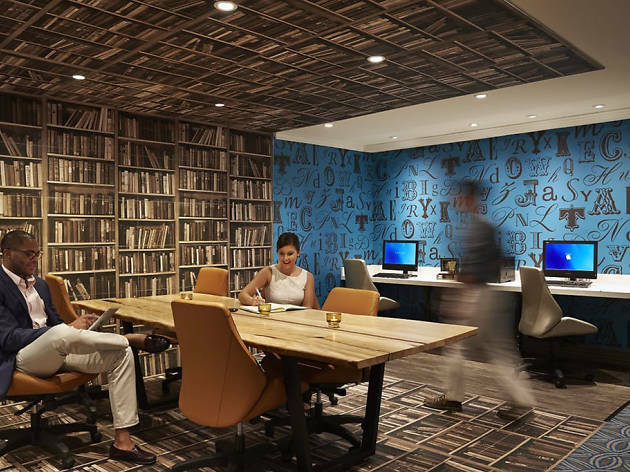 Time Out tip: The hotel’s on-site fitness center is much more than that. Guests can sign up for classes, schedule personal training sessions, design custom running maps or take out loaner bikes if in the mood to check out the neighborhood on two wheels. 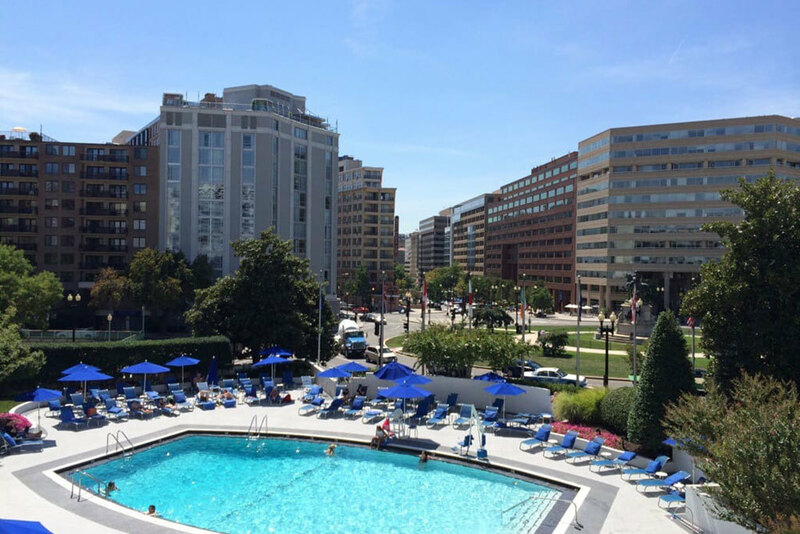 Believe it or not, this affordable hotel is home to one of the city’s best rooftop pools, complete with outstanding views of DC’s skyline and monuments. 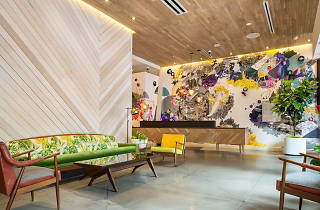 The building’s sleek, white exterior channels the futuristic ‘60s era during which it was built, but don’t expect that to be the case for the 340 guest rooms: They have all been renovated and modernized, alongside the suites and fitness center that guests can also take advantage of. 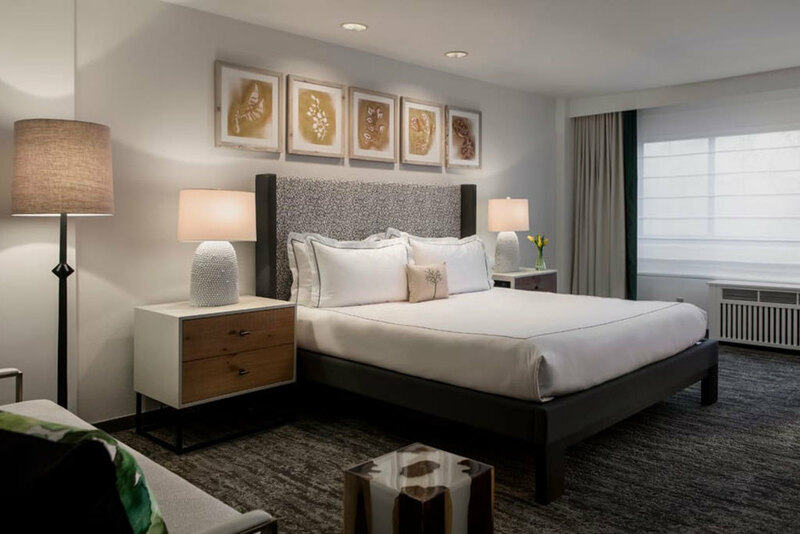 Centrally situated on DC’s Thomas Circle, guests are within walking distance to several hot restaurants and bars found along 14th Street and Dupont Circle, not to mention the White House and the shops at CityCenterDC. Time Out tip: If the seasonal pool is closed, don’t despair: You can still sip on cocktails by the fireplace at International Bar. 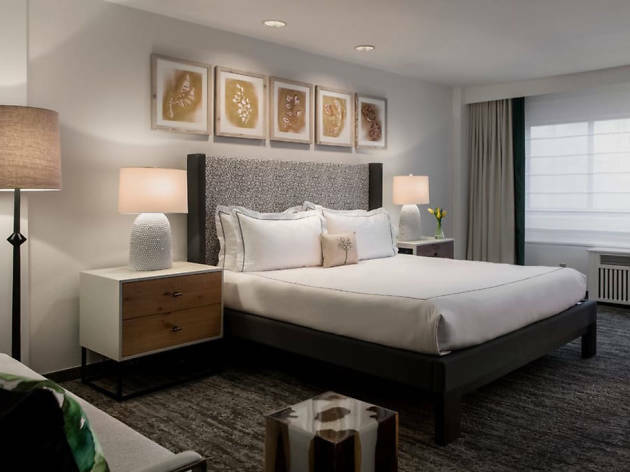 The go-to hotel for those seeking to be walking distance from the cherry blossoms that bloom near the Tidal Basic each spring, this Foggy Bottom spot is also near most of DC’s must-see tourist stops. The minimalist design with industrial touches (think exposed beams and rustic brick walls) makes this a hipster paradise, which happens to welcome pets and only accept credit cards. When cravings for delectable Italian food hit, pop into &pizza, one of the city’s most beloved homegrown fast-casual chains, which also runs a bar on the premise. 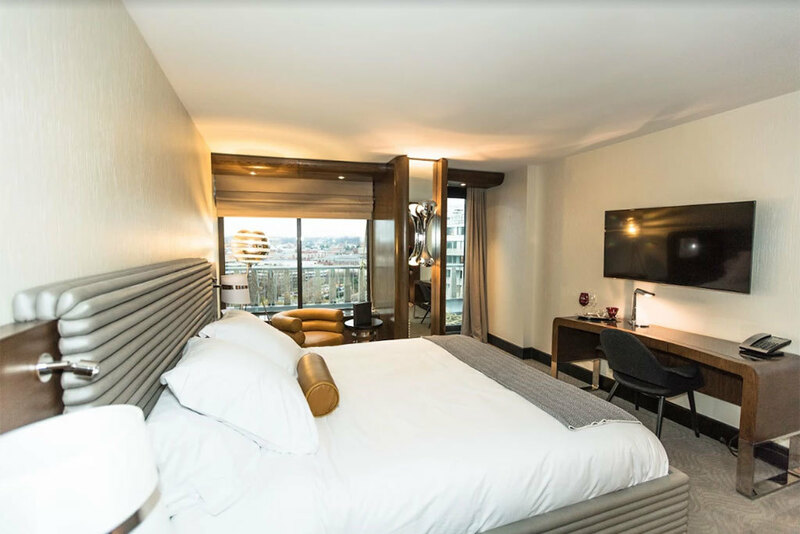 Time Out tip: If you book your stay on Hotel Hive’s website, as opposed to doing so through a third-party site, you’ll get a free upgrade, complimentary drink at the bar and up to a 5% discount on the best rate available. 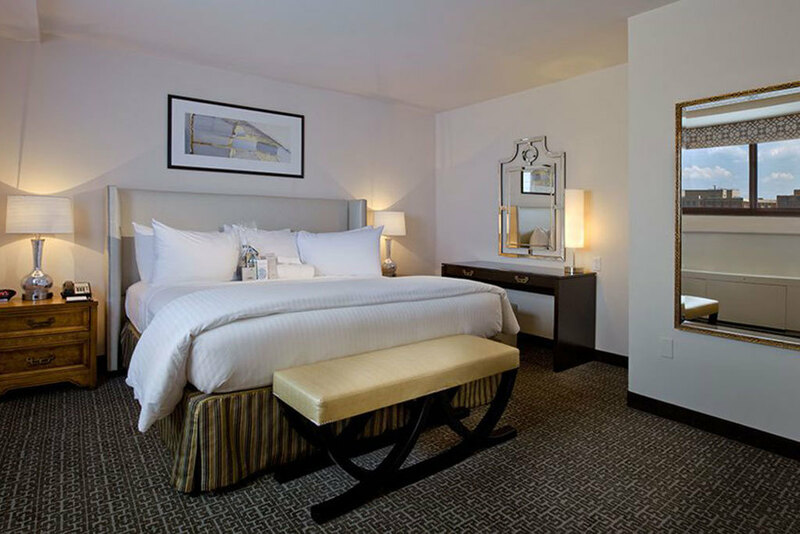 Tastefully decked out in silvery gray tones and an Art Deco design scheme, this Foggy Bottom hotel is ideal for business travelers and families who will make use the full kitchen and eating area in each room. 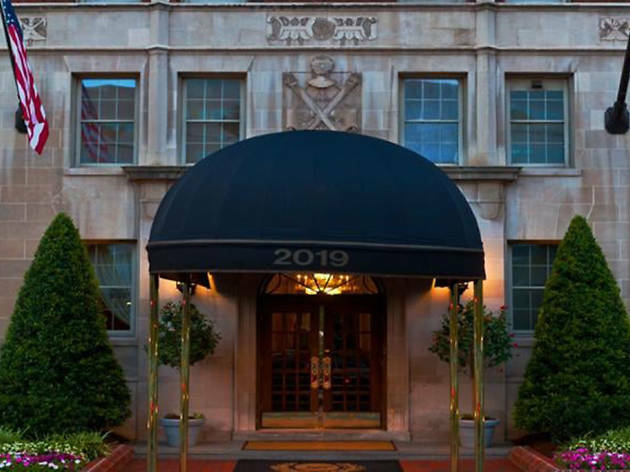 The venue’s location near the White House, Metro stop, Dupont Circle, George Washington University and the Kennedy Center are also convenient and desirable. 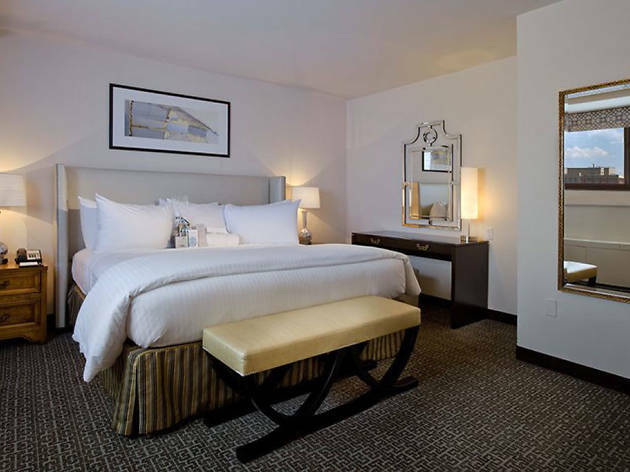 Amenities include in-room spa treatments and a fitness center… and a 24-hour CVS right next door. Time Out tip: If you want to avoid the usual fast food that seems to be inevitable when traveling, walk a few blocks north and dine at Beefsteak—DC celebrity chef Jose Andres’ version of healthy, tasty fast-casual. Want to experience old-school Washington? 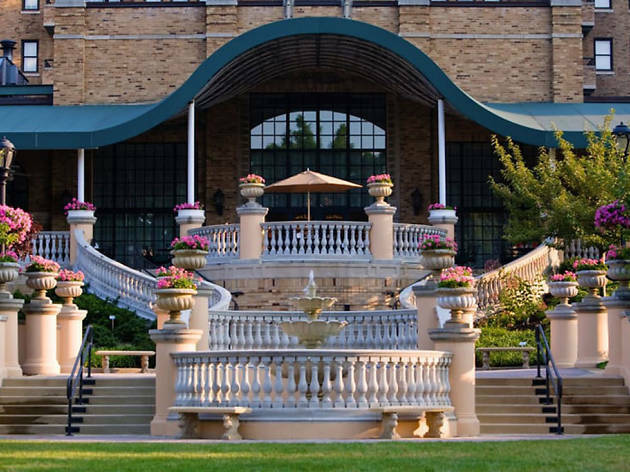 Stay at this opulent hotel built in 1926, which happens to be one of the Historic Hotels of America. 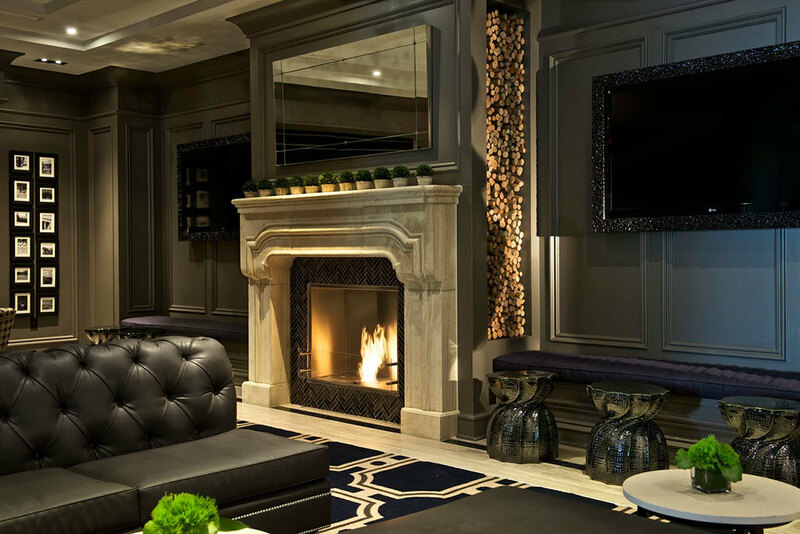 Expect traditionally elegant décor that includes imported furniture, Oriental rugs and retro touches like complimentary shoe-shines. 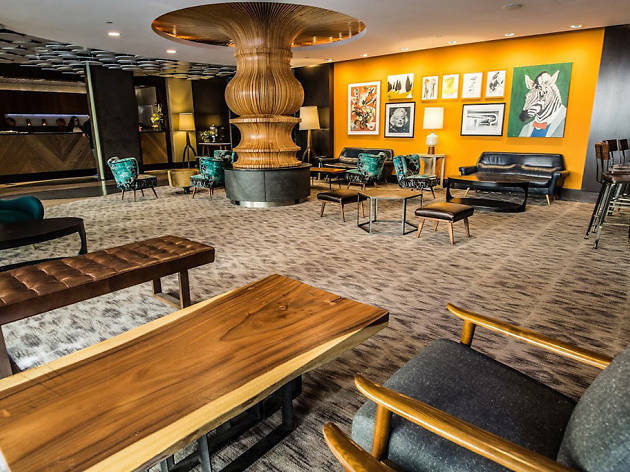 A stay here includes access to the bar and lounge and use of the Washington Plaza Hotel’s rooftop pool, a 10-minute Uber ride away. Guests can also indulge in assorted spa services like manicures, facials and massages—all available through Relax & Rejuvenate, an independent company that partners with hotels without in-house spas. 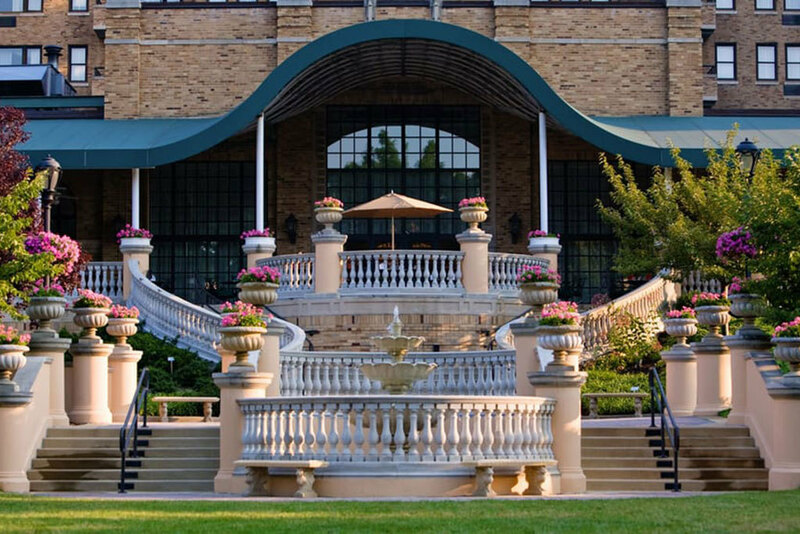 Time Out tip: Avoid the pricey valet parking, if you can.